Third through ninth grade public school students take the new STAAR test today, for the first time. KERA’s Bill Zeeble has more on the “end of course” State of Texas Assessment of Academic Readiness tests. It’s been roughly five years in the making, these newly-tweaked state tests that will eventually count for fifteen percent of student’s final grade. But not yet, says Debbie Ratcliffe, with the Texas Education Agency. Ratcliffe: No doubt remember, districts can defer for one year the provision that requires the “end of course score” to count fifteen percent of the student’s grades. That’s because districts and parents were worried bad grades could hurt student scores and school ratings. Ratcliffe says 520 school districts have deferred so far. She expects the remaining 700 or so will do so before the May 1st deadline. That means just about every district in the state, including Dallas and Fort Worth ISDs. Officials also warn that while tests won’t count this year, eventually they will for current 9th graders. That’s because four years from now, their Freshmen scores will be averaged into the graduating score. So TEA officials urge all students do the best they can, every time. 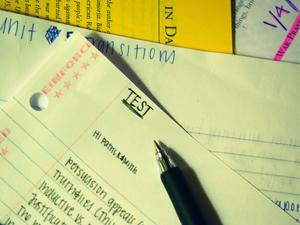 There will also be more tests than the old TAKS tests. And, they’ll be harder, according to Vincent Reyes. He’s, DISD’s Executive Director for Curriculum and Instruction. Reyes: The reason the exams are more difficult is that they will measure better how well prepared our students are to meet the challenges of college, starting even at the 3rd grade level. Reyes says that grade’s STAAR tests will also focus on that year’s course work. He says that fact sets it apart from past tests as well.